I heard a report on the news yesterday that ivory is once again a hot commodity, especially in China. This means poaching of elephants has drastically increased. It was a pretty disheartening story, especially because I find elephants to be really amazing animals (strong, smart, wrinkled with character). But the report also got me thinking. 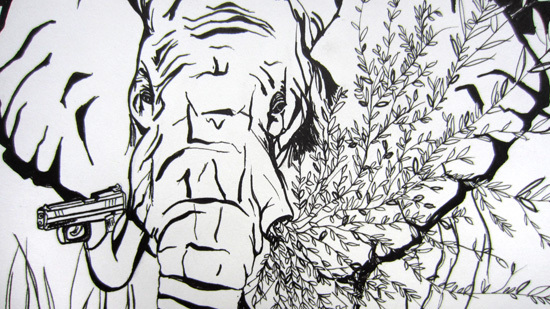 It is said that elephants have already begun to evolve smaller tusks due to poaching. Will this continue at a more drastic pace until the tusks are basically worthless little nubs? 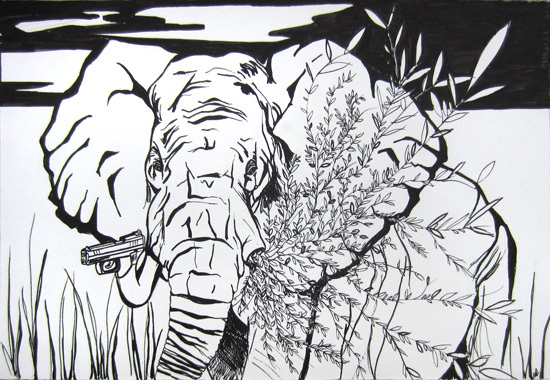 What kind of evolution would it take for elephants to truly defend themselves against poachers? Feeling like you can’t live without this drawing? Buy it here.